I am a post-doctoral researcher at the Perceiving Systems department of Michael Black, part of the Max Planck Institute for Intelligent Systems in Tübingen. Before that I was a PhD student affiliated with the University of Bonn and the Max Planck Institute for Intelligent Systems in Tübingen, working with Juergen Gall on Hand-Object Interaction. My alma mater is Aristotle University of Thessaloniki in Greece, where I closely cooparated with Leontios Hadjileontiadis. "Learning Joint Reconstruction of Hands and Manipulated Objects"
"Expressive Body Capture: 3D Hands, Face, and Body from a Single Image"
Links (pdf, data, models, code) coming soon. The dataset and models for our paper "Embodied Hands: Modeling and Capturing Hands and Bodies Together" is now online. Our paper "Embodied Hands: Modeling and Capturing Hands and Bodies Together" is accepted at SIGGRAPH-Asia 2017. Project's website. PhD thesis defended @ Uni-Bonn. PhD thesis submitted @ Uni-Bonn. Our paper "Reconstructing Articulated Rigged Models from RGB-D Videos" is accepted for oral presentation at the ECCV-Workshop on Recovering 6D Object Pose Estimation (R6D). Projet's website here. Our paper "Capturing Hands in Action using Discriminative Salient Points and Physics Simulation" is accepted from the IJCV special issue "Human Activity Understanding from 2D and 3D data". Project's website here. The Dataset, Source-Code and several Videos and Viewers for the ICCV'15 paper have been uploaded at the project's website. Extended abstract for our ICCV'15 paper "3D Object Reconstruction from Hand-Object Interactions" got accepted for a poster presentation at the 1st Workshop on Object Understanding for Interaction. 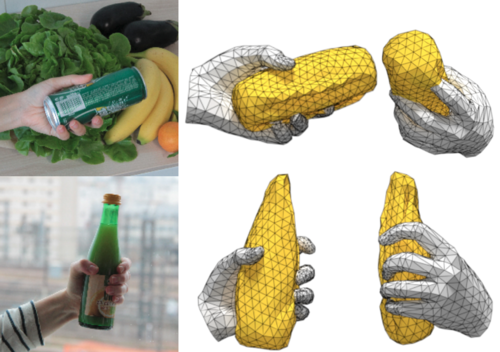 Our paper "3D Object Reconstruction from Hand-Object Interactions" got accepted for a poster presentation at ICCV'15. Project's website here. One paper submitted to IJCV is under review. Project's website here. GCPR Paper "Capturing Hand Motion with an RGB-D Sensor, Fusing a Generative Model with Salient Points" accepted for an oral presentation. Please visit the Project Page. GCPR Paper "A Comparison of Directional Distances for Hand Pose Estimation" accepted for a poster presentation. "Capturing Hand-Object Interaction and Reconstruction of Manipulated Objects"
"Adaptive algorithms for marker detection in an image: Application in the field of Augmented Reality"
"Epione: An Innovative Pain Management Solution"
"Batteries to power, turbines to speed, kick it baby!" Tilemachos Matiakis - Kenotom P.C.-I.K.E. RGB-D dataset of an object under manipulation. for each object and output articulated models. Hands are important to humans for signaling and communication, as well as for interacting with the physical world. Capturing the motion of hands is a very challenging computer vision problem that is also highly relevant for other areas like computer graphics, human-computer interfaces, and robotics. Hand motion capture with an RGB-D sensor gained recently a lot of research attention, however, even most recent approaches focus on the case of a single isolated hand. We focus instead on hands that interact with other hands or with a rigid or articulated object. 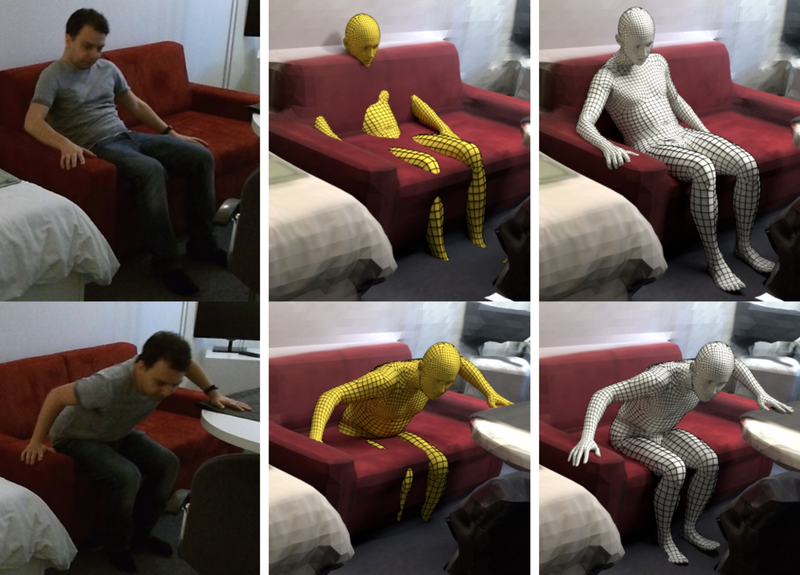 Our framework successfully captures motion in such scenarios by combining a generative model with discriminatively trained salient points, collision detection and physics simulation to achieve a low tracking error with physically plausible poses. All components are unified in a single objective function that can be optimized with standard optimization techniques. We initially assume a-priori knowledge of the object's shape and skeleton. In case of unknown object shape there are existing 3d reconstruction methods that capitalize on distinctive geometric or texture features. These methods though fail for textureless and highly symmetric objects like household articles, mechanical parts or toys. We show that extracting 3d hand motion for in-hand scanning effectively facilitates the reconstruction of such objects and we fuse the rich additional information of hands into a 3d reconstruction pipeline. Finally, although shape reconstruction is enough for rigid objects, there is a lack of tools that build rigged models of articulated objects that deform realistically using RGB-D data. We propose a method that creates a fully rigged model consisting of a watertight mesh, embedded skeleton and skinning weights by employing a combination of deformable mesh tracking, motion segmentation based on spectral clustering and skeletonization based on mean curvature flow. Georgoulis, S., Eleftheriadis, S., Tzionas, D., Vrenas, K., Petrantonakis, P., Hadjileontiadis, L. J. An innovative pain management system, namely Epione, is presented here. Epione deals with three main types of pain, i.e., acute pain, chronic pain, and phantom limb pain. In particular, by using facial expression analysis, Epione forms a dynamic pain meter, which then triggers biofeedback and augmented reality-based destruction scenarios, in an effort to maximize patient's pain relief. This unique combination sets Epione not only a novel pain management approach, but also a means that provides an understanding and integration of the needs of the whole community involved i.e., patients and physicians, in a joint attempt to facilitate easing of their suffering, provide efficient monitoring and contribute to a better quality of life. Tzionas, D., Vrenas, K., Eleftheriadis, S., Georgoulis, S., Petrantonakis, P. C., Hadjileontiadis, L. J.